If this sounds like your client then they are not alone; some of the greatest comedians in the world (the late Tommy Cooper, to name just one) have suffered exactly the same thing. Hypnosis can help to overcome stage fright and performance anxiety by teaching your clients relaxation and visualization methods that counteract the fight or flight trigger. 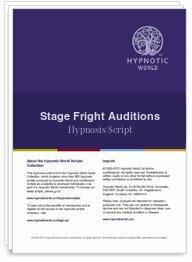 It is impossible to be tense and relaxed at the same time and this Stage Fright hypnosis session works by giving clients a special anchor to use as they go up on stage. This anchor interrupts the usual pattern of anxiety and ensures that they will be confident and happy in their ability to give the best performance of their life.